What is the Document Library? Why use Method:CRM for Field Services? What is the import/export tool? What is the Outlook Plug-In? Scoping for Acme Products Inc.
How does a database work? How does a table work? Can I convert my Method for QuickBooks Desktop account to a Quickbooks Online account? Why can't Method save changes to the transaction? Method is causing my Quickbooks to crash! Field size limitation of QBO for Ship tracking number. What are the QuickBooks SDK and IPP? The Method:API is intended to be a tool to allow external applications to integrate with Method applications, as an extension of the Method user experience. The API is available for no additional charge to all Method users. For documentation, help, and sample code, please click below to access the PDF doc. API Limits allow you to integrate your external applications with Method, in such a way that it does not cause performance degradation for other Method users. Removing any unnecessary calls to the API. Ensuring that your code handles API errors and responses, and doesn’t re-attempt the same failed calls repeatedly. 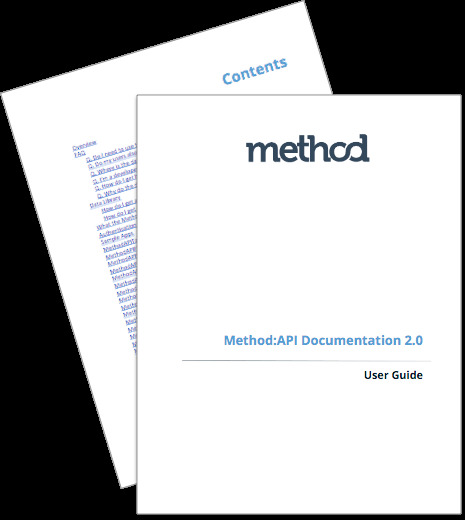 Method users who are interested in monitoring and understanding more about their API usage should contact their Method Account Rep for more on how to gain access to these details.